The European Union imports huge amounts of metal. Yet buried deep in Europe’s bowels is a treasure trove of copper, zinc and other precious metals. Researchers have been digging deep to uncover ways to put European mining back on the map and they’re not short of ideas. Europe’s deepest metal mine is seemingly unfathomable, at 1,430 meters. For forty years, Pyhäsalmi mine has been a rich source of copper, zinc and pyrites. “We currently produce around 1,4 million tons of ore per year but if the metal prices stay at the current level, we won’t be able to maintain the mine beyond the end of 2018”. Metal mining throughout Europe is facing similar problems but scientists from an European Union research project are becoming a regular fixture at the Pyhäsalmi Mine in an attempt to breath new life into an old industry. “Metal resources exist in Europe but extracting them is socially and economically challenging. Our research aims to develop more efficient exploration methods and also at imagining new ways to re-use mining waste materials to give European metal mining a fresh new impetus”. Finding new ores in active or abandoned metal mines is the researchers´first aim and that is no mean feat, especially for old, deep deposits. “Here in Finland and also in Sweden, the bedrock is very old, 2 billion years, or even older. So the rocks have been folded, folded again, faulted, moved. So something (the ore) that you expect to have there might have been moved somewhere else. Following the geological structures, the rock types at depths of 2 kilometers is very difficult. That is why researchers have developed sophisticated 3D models. They are aimed at helping to better understand the complex geology that envelopes the ore.
“What you see here in red are what we call “reflective zones”, underground regions whose material has a different density from the surrounding bedrock. That different density is one of the properties of the ore we are looking for. So these 3D maps help us to precisely spot those regions and calculate angles and distances for more accurate exploration drilling”. However, researchers have even bolder ideas to bring the luster back to metal mining and they are more than happy to share them in open forums. Swedish geologists have introduced sophisticated 3D underground mapping, to make drilling easier. “Diamond drilling is a very expensive business. So if you can get more robust computer models, so you need to drill less holes in order to target the mineral spots, then you will reduce the expenses needed to drill those deep holes. What we can describe in a 3D model like this is the rocks units, structures which could be important for guiding where ores are located in the crust. So it is all about chemical and physical properties of the rocks”. French researchers meanwhile, have shown the first ever interactive online database, detailing the metal resources deep underground in Europe. “Each enlargement is represented by just over 40 fields in a database. So it’s described in extreme detail: its type, geological formation but also the production, reserve, and resource levels too. Then it does the same for mine waste. Why waste? Well because the waste can contain substances that were rejected at the time, because no one knew what to do with it or didn’t have the technology to extract anything valuable and now we realise that waste can be used for the components of your mobile for example. “Therefore these so-called European wide critical substances – some say they’re strategic, others call them green metal ‘because they reduce the consummation of energy “. Scientists have developed a method to transform iron-rich mineral waste into materials for construction and painting. “In this bottle I have a typical example of mining shaft water, full with acids and sulfates. The only creatures that can live in this environment are bacteria that are able to oxidise iron. “The idea was to use the bacteria in an isolated reactor to create the environment to control this process. At the end of the process we have this material which we use to do several useful things. Polish scientists have developed a method to turn nanoparticles from the waste into Rhenium. A resistant metal that, allied with other metals, offers multiple applications. “We mix Rhenium with cobalt and with nickel and we can produce superalloys. Those resulting alloys can be used in very sophisticated applications in the aerospace industry, for instance. They can be used in the production of jet engines or turbines operating in very demanding conditions”. Last but not least, researchers want to develop new ways of greener mining. 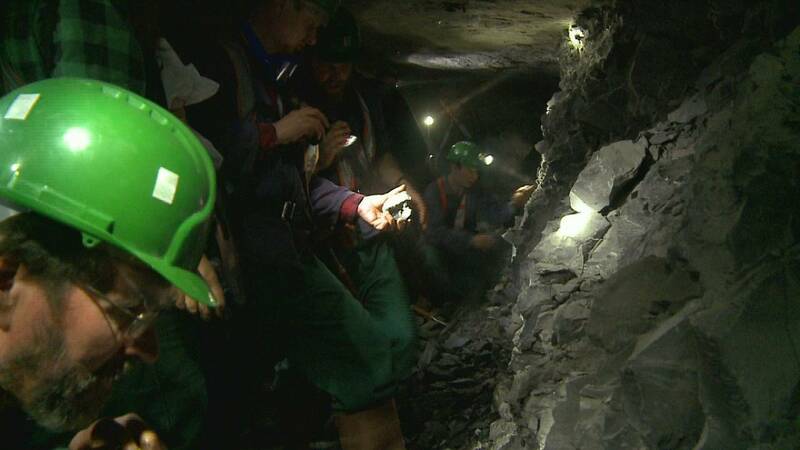 Poland is home to Europe’s biggest metal mine. 11 million tons of mineral ore are extracted per year including copper, silver and even gold. More than 2000 miners work here every day. The mine is testing new ways to enhance mineral extraction in more ecological ways, first results researchers say, are encouraging. So European metal mining is coming back in a big way, with scientists at the helm ready to unearth a potential hoard of wealth from right under our feet.